Five Bits & Bytes Farm off-the-track Thoroughbreds headed to Garland Mountain in North Georgia for a trail ride on the most spectacular day. The weather was sunny and unusually cool for a June day in Georgia. Classic Casey, Stormin in Style, Political Pull, Spot Run and Imatexan had a great run on the trails. It was a small but hardy group that set out to trail ride at Jake Mountain in North Georgia. The weather was forecasting an annoying light mist of rain with chances of heavier showers. That did not deter this group of friends from enjoying their off-the-track Thoroughbreds on a mountain trail ride and sharing a picnic. Learn how you can join the fun . . .
Last weekend was just perfect for riding and we have the perfect horses to ride . . . our off-the-track Thoroughbreds! October 10th, 2011 | Tags: Bits & Bytes Farm horse, trail ride, training at Bits & Bytes Farm | Category: News & Information, OTTB Updates, Photos! Sunday was such a perfect spring day that we decided to take the Oliver’s new 4 Star trailer on a test run to Garland Mountain in north Georgia with their two Thoroughbreds — Political Pull and Spot Run. We loaded four more Thoroughbreds into the Bits & Bytes Farm’s 4 Star to join in on the fun. So Romeo, With Wings, Monarch’s Reign and our newest off-the-track Thoroughbred, Detroit Iron aka “Andy” all enjoy trail riding. We have a photo gallery showing the beautiful day on our new page 2011 Outings and Training Photos. 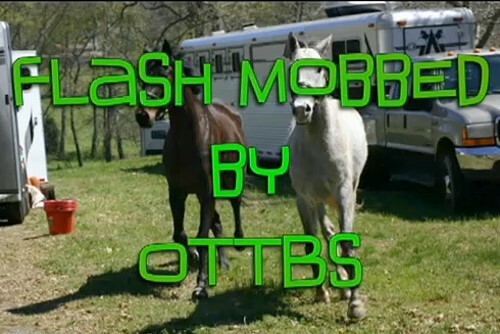 FLASH MOBBED by off-the-track Thoroughbreds! We had a wonderful trail ride with our Thoroughbreds on Saturday at our friend Julie’s farm in White, GA. After our trail ride and during our picnic we were flash mobbed by our Thoroughbreds. See the video. There are more photos on our Facebook page. Like our page so that you get the first notice of new Thoroughbred horses for sale from Bits & Bytes Farm.